The Tant Saree is a traditional style of Bengal saree. These are woven in cotton threads, and are light in weight with a bit of sheer factor. 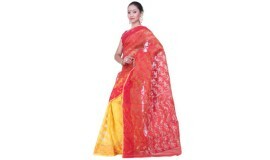 Tant saree is manufactured by weavers across West Bengal in India and in Bangladesh. Places around Hooghly district of West Bengal and Tangail in Bangladesh are the hotspots of Tant Saree weaving. Murshidabad is often referred to as the ‘Silk Mecca’ of East India. It is a city ingrained in the culture of silk and everything related to sericulture to weaving and printing takes place in the city itself. The city also boasts of a Centre of Sericulture Research and Training Institute that educates the silk weavers, to produce the finest quality of silk and thus uplift the silk industry. Tussar Silk has its origins in Malda, a town in West Bengal. The silk is extremely textured and is cultured from the hives of mulberry. If we trace the history of raw silk, it can be said that Tussar silk was a discovery of the medieval times. Tussar is highly valued for its natural gold colours, which it inherits from a typical kind of yellowish brown coloured moths. These wild winged moths feed on the leaves of Asan and Arjun plants.